The United States and Iraq have agreed on a plan to send approximately 500 additional U.S. troops to Iraq to assit Iraqi forces in the effort to retake Mosul from ISIS. 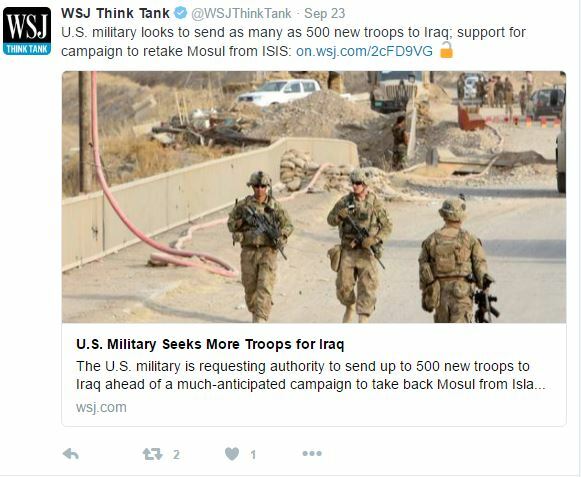 There are currently 4,565 U.S. troops in Iraq with the current ceiling being 4,647 troops. In order to send a significant amount additional forces the U.S. must receive approval from the Iraqi government. Most of the U.S. troops will be deployed to northern Iraq to assist Iraqi forces in retaking the city. Others will be sent to various locations throughout the country based on the need for man power in particular locations. American troops will not be battling ISIS on the front lines. They will instead act as advisors. U.S. military troops will be placed closer to battle than they have in previous situations due to the nature of the mission. Both American an Iraqi military officials believe this will be the last time additional troops are sent to Iraq.